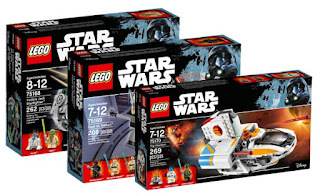 SWCP: Teve um pequeno papel no episódio I de Star Wars.Como foi essa experiência?Pode falar um pouco mais sobre o seu papel? D.M: Deram-me um pequeno papel no final de `A Ameaça Fantasma´. 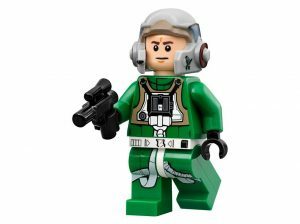 O nome do meu personagem é Dams Denna (que é uma brincadeira com o meu nome) ele é um tratador de um Kaadu em Naboo. Foi uma experiência incrível. 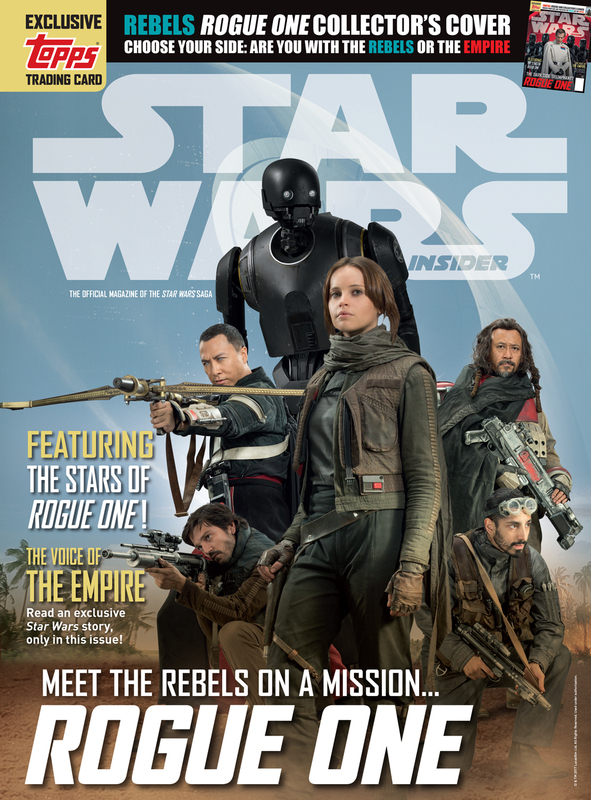 Eu já estava em Londres a passar uma semana no set de um episódio a entrevistar o elenco e a equipa para a revista Star Wars Insider . Disseram-me que eu seria um extra no filme, mas quando cheguei aos cenários, deram-me uma parte destacada como o tratador do Kaadu. Foi divertido ver como eles fizeram aquela cena juntos já que apenas havia metade do número de pessoas a assistir ao desfile e metade do cenário. Completaram tudo o resto em CG. Com a minha parte específica, não havia nada lá e fui instruído para alcançar e agarrar as rédeas de uma criatura imaginária. Não tinha ideia do que iria parecer no final. 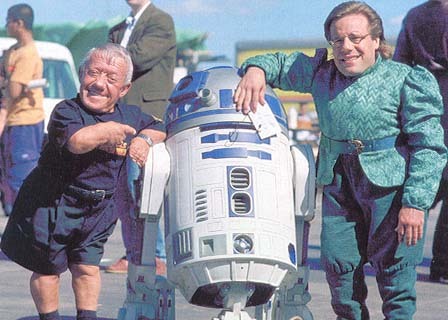 Todos os Gungans no desfile eram homens de uniformes brancos de salto - os Gungans mais tarde foram adicionados em CG. Apesar de tudo, foi uma experiência fantástica, criei laços de amizade com muitos extras e membros da equipa e pude ver como é que a cena inteira foi montada. Tive de ficar mais uma semana porque que eles tiveram que fazer umas filmagens adicionais devido a problemas climatéricos, tive assim de ficar uma semana extra só para fazer aquela pequena parte da cena. 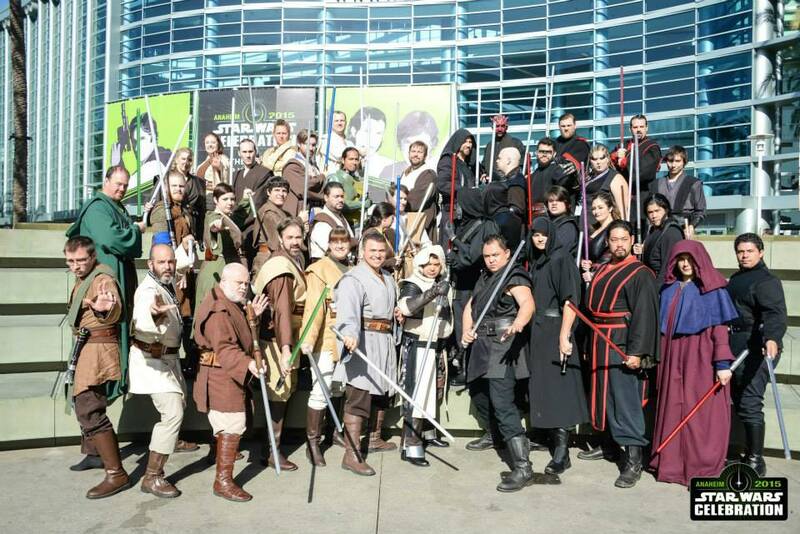 SWCP: Participou na Star Wars Celebration em Anaheim.Do que gostou mais desse evento? D.M: Todas as Celebrações são muito especiais para mim e eu adorei Anaheim. Para sentir a emoção e a ligação dos fãs, é muito especial. É algo que quando era criança eu só sonhava em participar. No início de 1998, fui solicitado pela Lucasfilm para produzir a primeira Celebração de Star Wars aqui em Denver, Colorado. 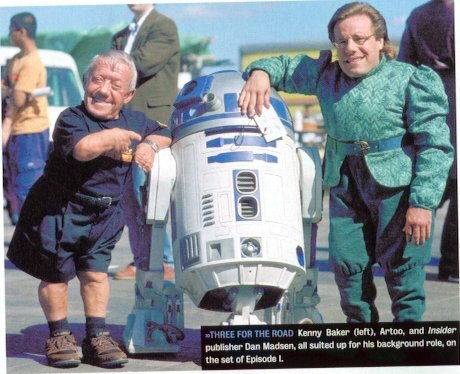 Foi muito trabalho em muito pouco tempo e desafios incríveis, mas, juntamente com o Anthony Daniels e a minha incrível equipa a trabalhar no clube oficial de fãs de Star Wars,conseguimos esse objetivo apesar de termos apahnado com o pior tempo que Denver tinha visto em 100 anos. 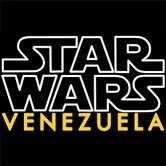 Foi o Woodstock de Star Wars! SWCP: É também o fundador do clube oficial de Star Trek.É UM `Trekker´? D.M: Eu sou um Trekker - sempre amei Star Trek mesmo antes de Star Wars existir.Cresci com a série original de Star Trek, e essa tripulação original é a minha favorita. 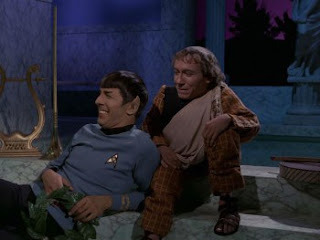 Quando o Kirk disse ao Alexander no episódio ´Plato's Stepchildren´: "Alexander, de onde venho, tamanho, forma ou cor não faz diferença", essas palavras agitaram o mundo de um miúdo com 14 anos de idade e uma "pessoa pequena"como era eu.A minha vida nunca seria a mesma, literalmente. Sonhei com um futuro onde seria aceite por quem eu era, e não pela minha pequena estatura.Star Trek apresentou-me um mundo em que cada ser humano era estimado tal como era e aceitado pela sua singularidade. 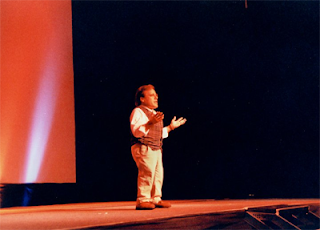 Não importava se você era gordo,magro,baixo, alto,, azul, verde ou até mesmo se você tivesse um corpo humano... você seria um membro apreciado do universo e, como tal, respeitado e valorizado. Enquanto o mundo ao meu redor ainda está com problemas, sinto que percorremos um longo caminho na aceitação dos outros desde o dia em que assisti ao meu primeiro episódio de Star Trek. Vejo que as pessoas, em geral, são mais tolerantes com "gente pequena" como eu. Sem Trek,a minha vida não seria tão gratificante e proveitosa. Trinta e cinco anos depois de“Plato’s Stepchildren, , sinto-me muito mais confiante que, se pudesse,, poderia também olhar nos olhos do Alexander e dizer, "De onde eu venho, tamanho, forma ou cor não fazem diferença." 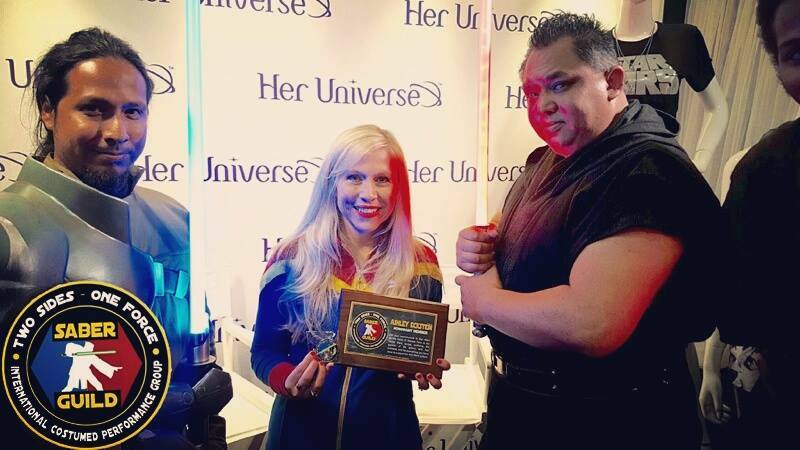 SWCP: Envolveu-se em diversas “Frentes”: Desde o universo Star Wars a ator,escritor,organizador da Star Wars Celebration e mais recentemente como manager da atriz Ashley Eckstein(A voz da Ahsoka Tano em SW:Clone Wars).Há mais algum projeto relacionado com Star Wars em que esteja envolvido? 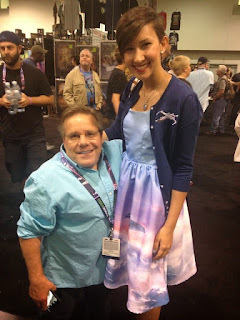 D.M: Sinto-me entusiasmado por estar a trabalhar agora com a Hot Topic, que recentemente adquiriu a Her Universe e continuar a trabalhar com a Ashley Eckstein que ainda supervisiona toda a empresa para comercializá-la em muitas frentes. A Ashley e o marido, David, são duas das melhores pessoas que já conheci. A Her Universe é uma empresa fantástica e vai ainda ficar maior e melhor. 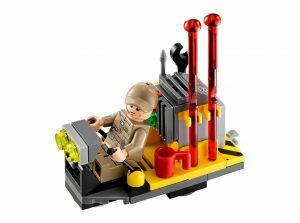 Outra coisa que estou atualmente envolvido, é na minha própria empresa chamada FanSets , com mais dois sócios. Criamos pins colecionáveis de várias licenças e de moda. 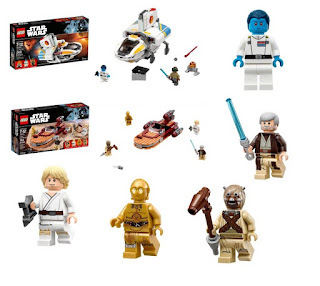 Você pode ver as nossas linhas em www.fansets.com. Nós atualmente detemos licenças para Star Trek, DC Comics e Harry Potter e estamos a trabalhar para mais! 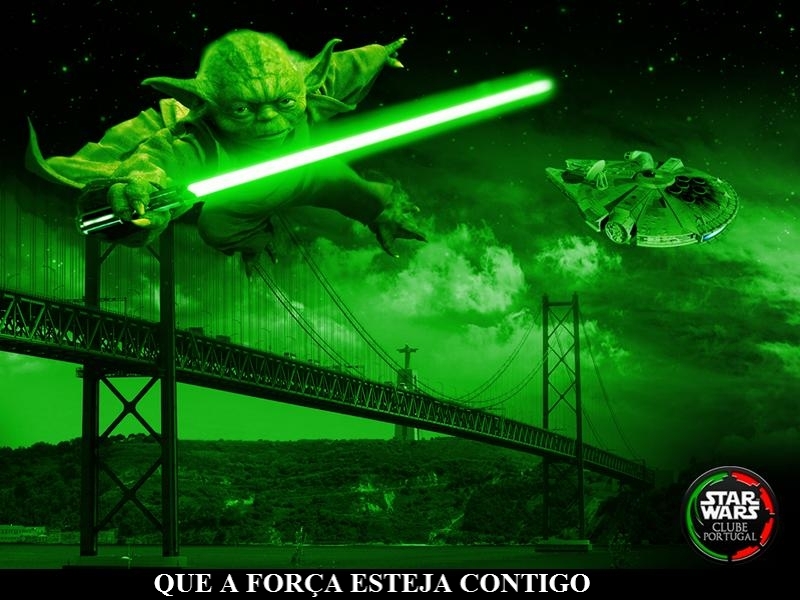 SWCP: Participou no documentário ` The Force among us´.Como foi essa experiência? D.M: Oh, isso foi ótimo. Um dos meus queridos amigos como resultado dessa experiência é o realizador/produtor Cris Macht. Ele reservou um voo para mim e para a minha esposa de modo a irmos a Chicago para fazer essa entrevista e divertimo-nos muito. 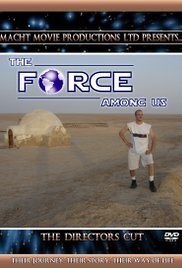 Adoro `The Force Among Us´ é um documentário fantástico e divertimo-nos imenso a realizá-lo. Em consequência disso, alguns dos meus melhores amigos no universo de fãs de Star Wars vivem em Chicago. 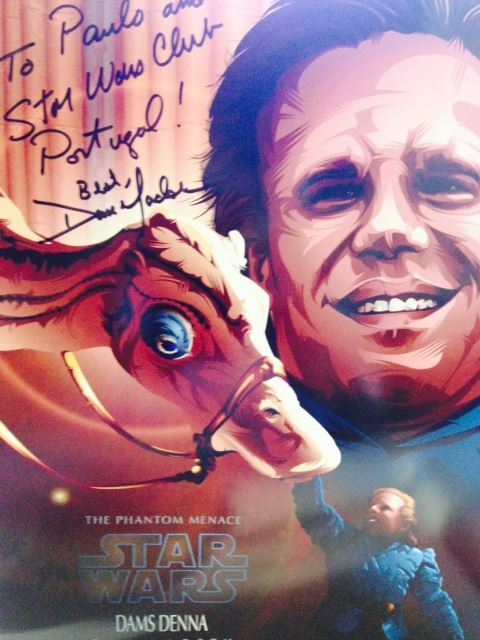 Dan Madsen is a former president of the Official Star Wars Fan Club and the founder and former publisher of the Star Wars Insider magazine. 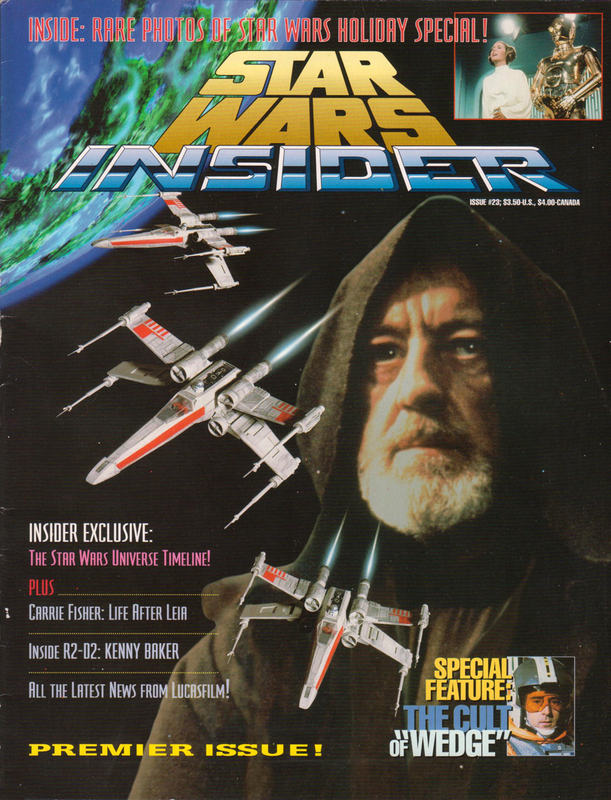 A journalistic writer, he contributed many of the interviews and pieces to the Lucasfilm Fan Club Magazine.Madsen also did a cameo in Star Wars:Episode I as a kaadu handler. 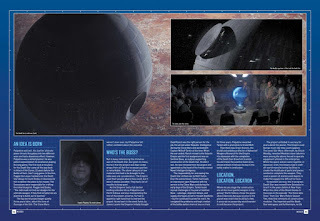 SWCP: You had a cameo on Star Wars:Episode I.How it was this experience?Could you tell us a bit more about your role? D.M: I was given a cameo at the end of Phantom Menace. 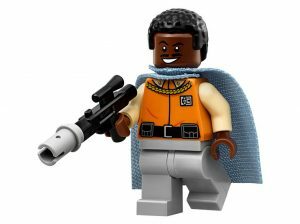 My character's name is Dams Denna (which is a play on my name) and he is a Kaadu Handler on Naboo. It was an amazing experience. I was already in London spending a week on the set of Episode One for the Star Wars Insider. 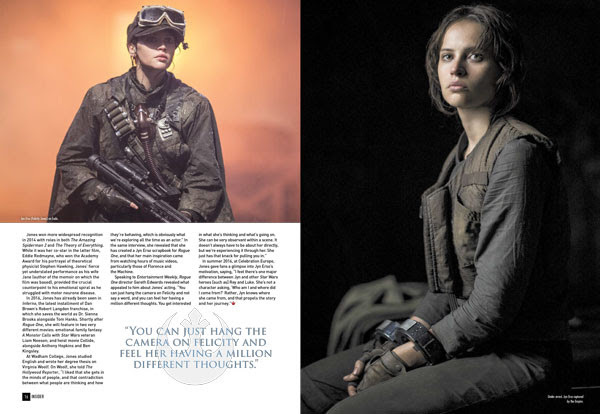 I was interviewing cast and crew for the fan club magazine. I was told I would be an extra in the film but when I got on the set they gave me a spotlighted part as the Kaadu Handler. It was fun to see how they brought that scene together as there were only half the number of people watching the parade and half the set. They CG'd everything else. With my particular part there was nothing there and I was instructed to reach up and grab the reins of an imaginary creature. I had no idea what it would look like. 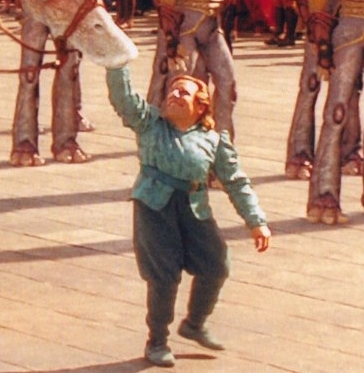 All the Gungans in the parade were guys in white jump suits - the Gungans were later added CG. All in all, it was a fantastic experience, got to bond with many of the extras and crew members and see how that whole scene was put together. I actually had to stay an extra week as they had to do some additional shooting which I was going to be in due to weather issues so I hung around for an extra week just for that small part. SWCP: You participated on Star Wars Celebration at Anaheim.What did you like most of this event? D.M: All the Celebrations are very special to me and I loved Anaheim. To feel the excitement and bond of the fans is very special. It is something that as a kid I could only dream of participating in. 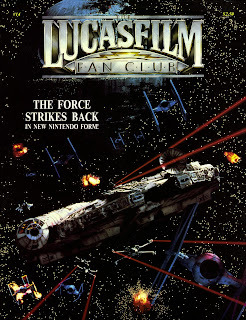 In early 1998, I was asked by Lucasfilm to produce the very first Star Wars Celebration here in Denver, Colorado. It was a lot of work in very little time and amazing challenges but, together with Anthony Daniels and my amazing crew working at the Official Star Wars Fan Club we made it happen despite some of the worst weather Denver had seen in 100 years. It was Star Wars Woodstock! 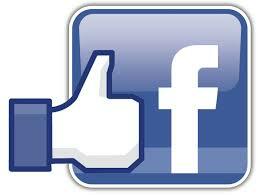 SWCP: You are the founder of the official Star Trek Fan Club.Are you also a Trekker? 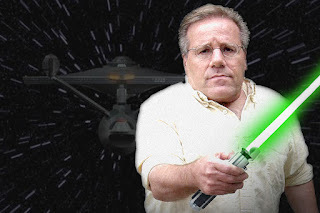 D.M: I am a Trekker - have always loved Star Trek - even before Star Wars was in existence. I grew up with the original Star Trek series so that crew is my favorite. 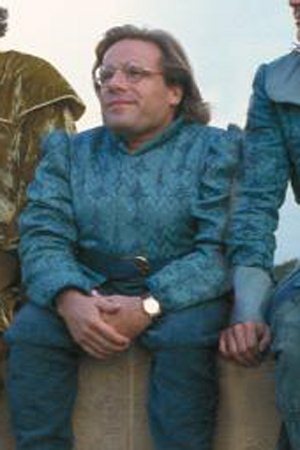 When Kirk said to Alexander in the episode Plato's Stepchildren, “Alexander, where I come from size, shape or color makes no difference," those words rocked my world as a 14-year old and a “little person.” My life would never be the same, literally. I dreamed of a future where I’d be accepted for who I was, not how tall I was or how I looked. Trek presented me a world in which every human being was treasured for who they are and accepted for their uniqueness. It didn’t matter if you were tall, short, fat, skinny, blue, green or even if you had a human body... you were an appreciated member of the universe and, as such, respected and valued. While the world around me is still troubled, I feel we’ve come a long way in the acceptance of others since the days I watched my first Trek episode. I see that people, in general, are more accepting of “little people” like me. Without Trek, my life would not have been as rewarding and fruitful. Thirty-five after “Plato’s Stepchildren,” I feel much more confident that, if I were able to, I could also look Alexander in the eye and say today, “Where I come from size, shape or color makes no difference." 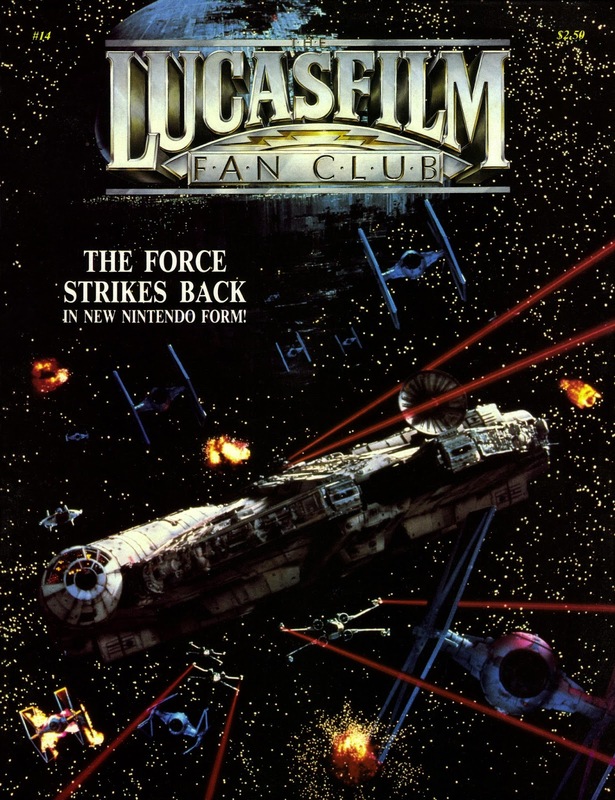 SWCP: You have been involved in several "fronts" in the Star Wars Universe,since actor,staff writer for the Lucasfilm fan club magazine,to organizer of Star Wars Celebration(I and II,right?) and you´re also the currently agent for the actress Ashley Eckstein(Ahsoka Tano from SW:Clone Wars).Are there any other works related to Star Wars,that you are currently working on? D.M: Just excited to be working now with Hot Topic who recently acquired Her Universe and continue to work with Ashley Eckstein who still oversees the entire company to market it on many fronts. Ashley and her husband, David, are two of the finest people I have ever known. Her Universe is a fantastic company and it just going to get bigger and better. The other thing I am now involved in is my own company, with two partners, called FanSets. 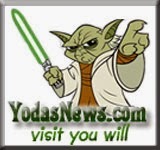 We create licensed collectible pins and pin sets. You can see our lines at www.fansets.com. We currently hold licenses for Star Trek, DC Comics and Harry Potter and are working on more as we speak! 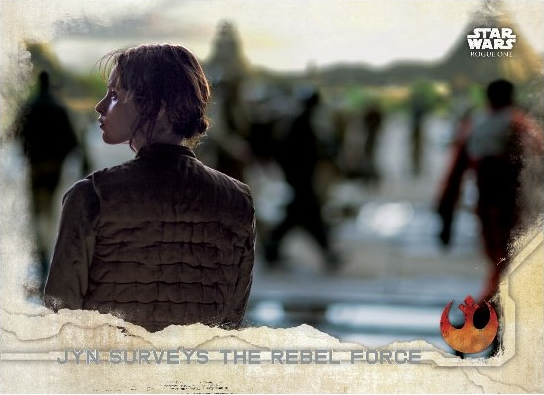 SWCP: You participated on the documentary `The Force among us´.Tell us about this experience. D.M: Oh, that was great. 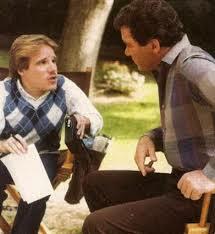 One of my dear friends as a result of the experience is the director/producer Cris Macht. He flew me and my wife to Chicago to do that interview and we had so much fun. 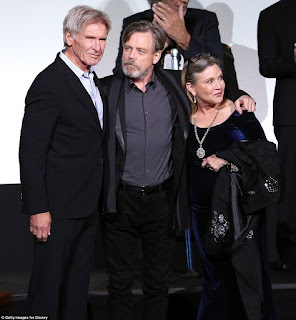 I love The Force Among Us - it is a fantastic documentary and we had so much fun making it. As a result of that, some of my best friends in the Star Wars fan universe live in Chicago. D.M: Just keep the faith! This is one of the best times to be a STar Wars fan with all of the new projects in the works. I never thought we would see a time like this back before the prequels and even after so I am thrilled to be experiencing it with all of you. I feel like I am 14 years old again and I cannot wait to see Rogue One! 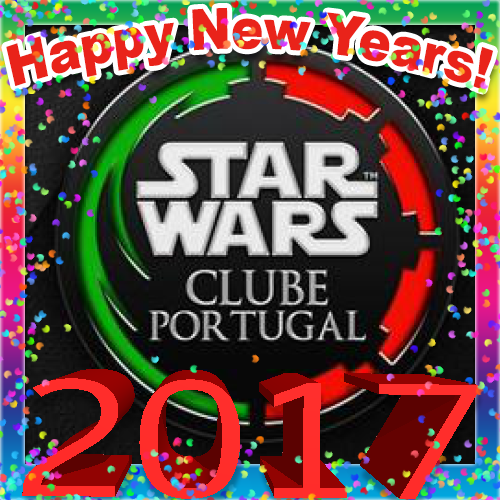 Desejamos a todos os nossos sócios,amigos e leitores um magnífico ano de 2017 e... que a Força esteja convosco! 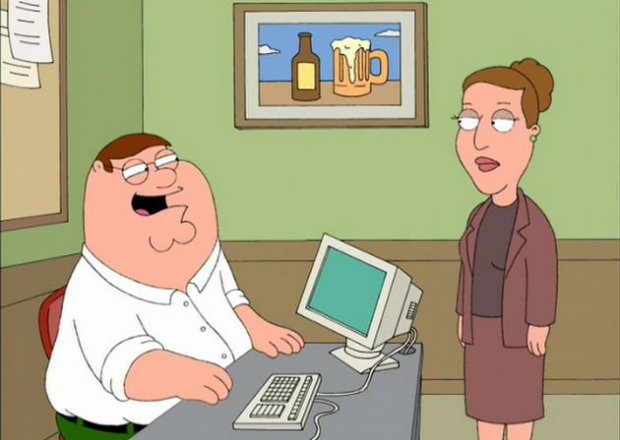 A voz da recente falecida actriz,Carrie Fisher,pode ser ouvida em dois episódios de `Family Guy´.Fisher já tinha terminado as gravações nesta série onde surgiu pela primeira vez em 2005 no papel da Angela.No oitavo filme de Star Wars também já tinha terminado as gravações pelo que a poderemos rever nas salas de cinema em 2017. "Rogue One" e uma ressurreição polémica: Estará Hollywood a ir longe demais? A opção artística do realizador Gareth Edwards para "Rogue One: Uma História de Star Wars" é um ponto de viragem em Hollywood e levanta a questão ética sobre até onde se está disposto a ir com o uso da tecnologia. 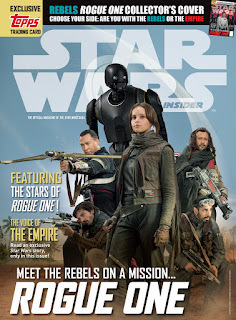 ARTIGO COM SPOILERS do filme "Rogue One: Uma História de Star Wars". "Rogue One: Uma História de Star Wars" estreou nas salas há vários dias. É muito provável que os fãs mais ardentes já o tenham visto até mais do que uma vez — em Portugal foram mais de 110 mil na primeira semana, mas este ainda é o momento para dizer que este artigo tem spoilers. É provável que já saiba do que se trata pois está a suscitar um debate sobre os limites e a ética (ou falta dela) de Hollywood: a aparição digital de Peter Cushing como Grand Moff Tarkin. A notícia da sua "participação" surgiu no verão de 2015 e foi encarada por quase todos como mais um rumor à volta da saga. 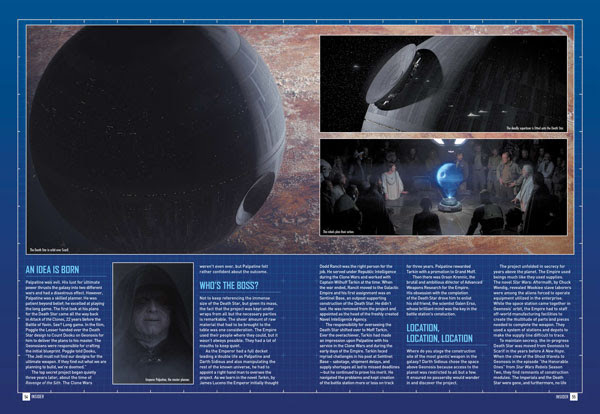 Mesmo quem a levou a sério pensou que se trataria de uma aparição simbólica, um pouco como aconteceu no final de "A Vingança dos Sith", quando uma versão mais jovem aparecia ao lado do Imperador Palpatine e de Darth Vader a fiscalizar a construção da primeira Estrela da Morte. 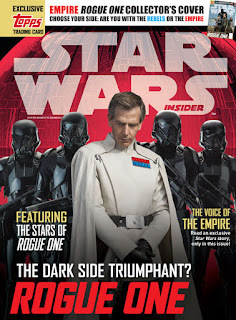 O que acontece em "Rogue One" é diferente: Tarkin é uma personagem integral da história e o venerável britânico falecido em 1994 foi ressuscitado para dar uma nova interpretação do vilão. Ultrapassa o trabalho da Weta Digital, a empresa de efeitos especiais fundada por Peter Jackson, para criar uma personagem digital que permitisse completar as cenas de Paul Walker em "Velocidade Furiosa 6", em 2015. A Disney só vai revelar pormenores do processo em janeiro, quando tiver passado tempo suficiente para quase todos os interessados assistirem ao filme, mas sabe-se que o ator Guy Henry, que tem uma vaga semelhança com Cushing, foi escolhido para fazer os gestos e dizer as frases de Tarkin e a partir disto, a tecnologia informática da Industrial Light & Magic conseguiu criar depois uma réplica quase perfeita, com olhos expressivos e onde quase desaparece o brilho artificial semelhante à pele de cera. 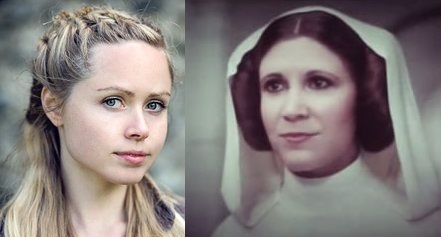 Curiosamente, perto do fim de "Rogue One" existe um momento, muito mais breve e menos convincente, em que a Princesa Leia de Carrie Fisher surge tal como a vimos pela primeira vez em 1977- a atriz norueguesa Ingvild Deila também serviu de modelo para a imagem da Princesa Leia Organa, mas a opção artística tomada pelo realizador Gareth Edwards, que preferiu manter o legado de Cushing em vez de simplesmente escolher outro ator, após receber garantias que o processo seria credível, mostra que longe vão os tempos em que foi uma dor de cabeça sobrepor as cabeças de Brandon Lee e Oliver Reed no corpo de outros atores para completar os breves instantes que faltavam de "O Corvo" (1994) e "Gladiador" (2000), efeitos engenhosos que agora parecem toscos. aceitariam se fossem vivos? 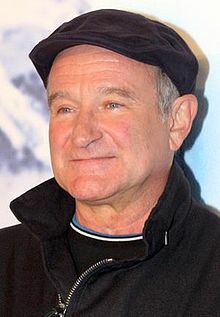 Não podemos deixar de pensar que tudo isto pesou na decisão de Robin Williams de criar disposições no seu testamento que impedem a utilização da sua imagem até 2039, mas sabe-se que outras estrelas já fizeram digitalizações completas para serem usadas pelas tecnologias do futuro, garantindo assim outra fonte de sustento aos seus descendentes. 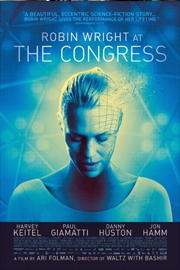 Qualquer que seja a resposta à questão, Hollywood aproxima-se a passos largos da ficção científica de "O Congresso". 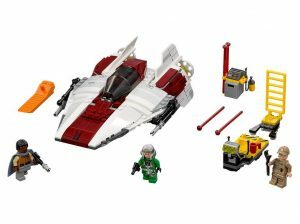 A-Wing com as figuras do piloto,rebelde da tripulação em terra e Lando Calrissian.Estes modelos deverão estar já à venda neste mês. Já aqui tínhamos noticiado que a atriz Carrie Fisher tinha sofrido um grave ataque cardíaco durante um voo comercial entre Londres e Los Angeles e que se encontrava hospitalizada.Depois de ter ficado estabilizada,eis que surge a notícia do seu falecimento aos 60 anos de idade,hoje de manhã! 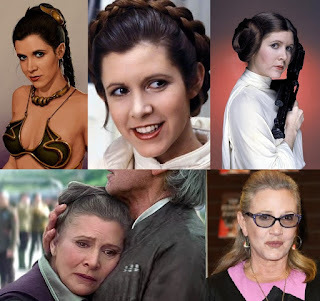 Num ano desafortunado para várias celebridades do show business, é com grande mágoa que vemos partir um dos ícones da saga Star Wars.Fisher além de ser uma das atrizes principais da trilogia clássica,teve o seu derradeiro papel como Leia Organa em `O Despertar da Força´ e em Star Wars: Episódio VIII.Os nossos sinceros pêsames aos seus familiares. 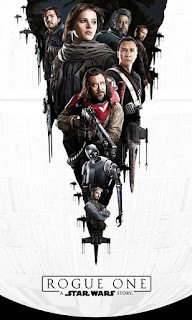 Agora que a maioria dos fãs já viu o novo filme de Star Wars (Rogue One) gostaríamos de saber a vossa opinião; O que mais gostaram o que não gostaram o que gostariam de ter visto, a cena mais épica do filme,o que acharam do regresso de Darth Vader e Almirante Tarkin, etc. Preparem um texto com a vossa opinião e enviem-no para o nosso endereço eletrónico, mensagem privada pelo facebook ou comentem neste post. 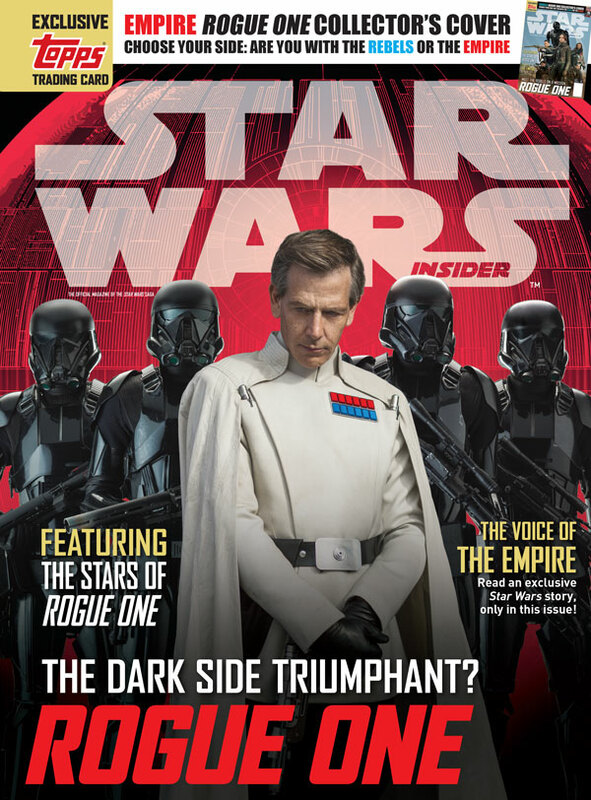 A edição 170 da revista Star Wars Insider,revela um dos maiores mistérios da saga: Quem foram os bravos que desafiaram o Império e ajudaram a Aliança Rebelde a alcançar a primeira grande vitória?Os personagens de Rogue One têm destaque especial nesta revista que inclui um brinde-uma trading card exclusiva da Jyn Erso.Há duas versões diferentes das capas de colecionador à escolha:Rebeldes ou Imperiais. 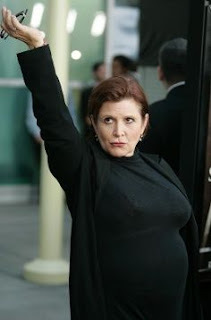 Carrie Fisher sofreu um grave ataque cardíaco! 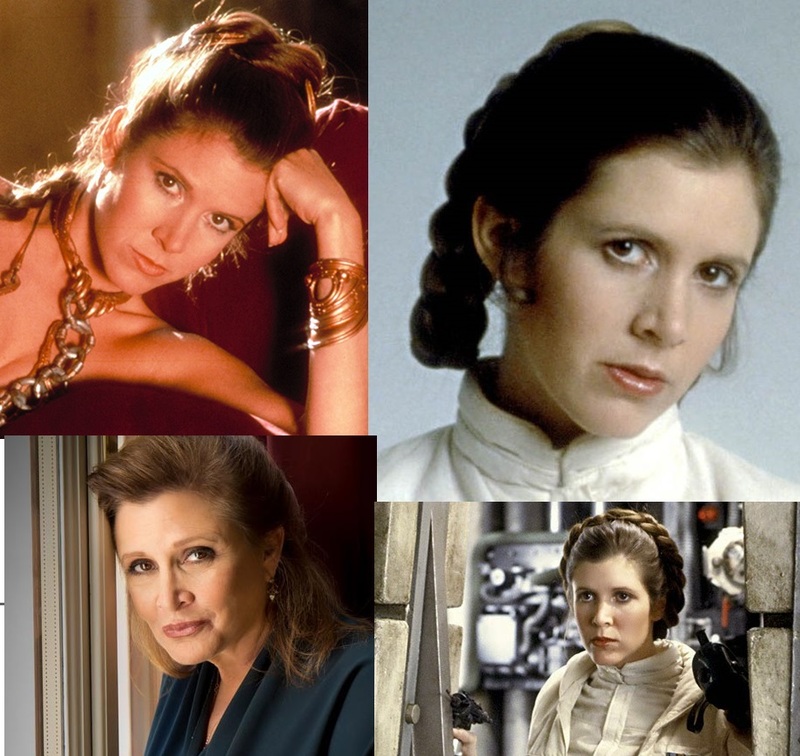 Carrie Fisher sofreu um grave ataque cardíaco durante um voo entre Londres e Los Angeles na passada sexta-feira.A atriz de 60 anos, conhecida a nível mundial como a Princesa Leia da saga "Star Wars", começou a vomitar e disse que não conseguia respirar, tendo a tripulação, bem como médicos e enfermeiros que eram passageiros, feito manobras de reanimação cardiorrespiratória. Após a aterragem 15 minutos mais tarde, quando eram 20h15 em Lisboa, foi conduzida inconsciente ao hospital mais próximo, o Ronald Reagan UCLA Medical Center. De acordo com o Los Angeles Times, o seu estado era considerado crítico. Quando passavam alguns minutos da meia-noite de sábado em Portugal, o irmão, Todd Fisher, teria dito à Associated Press que a atriz saiu das urgências para a Unidade de Cuidados Intensivos (UCI) e, embora permanecendo ligada ao ventilador, estava em "situação estável". No entanto, já perto das duas da manhã, indicava à publicação Variety que não era essa a situação e que tinham sido feitas interpretações precipitadas das suas palavras. "Ela está na UCI e todos rezam por ela. Não existe nada de novo dos médicos. Nada de todo. Não existem nem boas nem más notícias".Numa arrepiante coincidência, tinha sido alvo de uma notícia falsa na quinta-feira que dava conta da sua morte às 11 horas da manhã.Filha da realeza de Hollywood — o seu pai era o cantor Eddie Fisher (1928-2010) e a mãe a atriz Debbie Reynolds (1932) —, ficou famosa em 1977, com apenas 20 anos, graças ao papel de Leia em "Star Wars", que repetiu em "O Império Contra-Ataca" em 1980 e "O Regresso de Jedi" três anos mais tarde, regressando o ano passado em "O Despertar da Força". Mark Hamill e Peter Mayhew, intérpretes de Luke Skywalker e Chewbacca em "Star Wars", estiveram entre as primeiras estrelas a desejar nas redes sociais as rápidas melhoras da atriz Carrie Fisher quando surgiu a notícia de que tinha sofrido um grave ataque cardíaco durante um voo entre Londres e Los Angeles na sexta-feira.A eles juntaram-se David Prowse e Billy Dee Williams, o ator que deu corpo a Darth Vader e o Lando Calrissian na primeira trilogia, Gwendoline Christie, do recente "O Despertar da Força", e muitos outros amigos, colegas e fãs. Liam Neeson (O Mestre Jedi Qui Gon Jiin/Star Wars I) interpreta o jesuíta porrtuguês Cristóvão Ferreira no novo filme de Martin Scorsese `Silêncio´ que fala sobre os jesuítas no Japão no século XVII.Este filme que chegará às salas de cinema do nosso país a 19 de Janeiro de 2017,conta ainda com a participação de outro ator de Star Wars: Adam Driver( O Kylo Ren de Star Wars VII). O grupo internacional Saber Guild Council ( www.saberguildcouncil.com ) dedica-se à performance e costuming de sabres de luz.Nesta entrevista À diretora de relações públicas internacionais,Adrienne Procaccini,vamos a ficar a conhecer um pouco mais sobre este grupo. 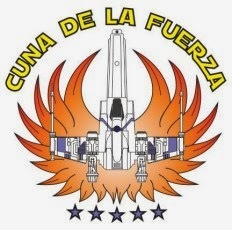 SWCP: Como e quando surgiu a ideia de criar o Saber Guild Council? A.P: Desculpa, eu não estava ainda no grupo quando este foi formado. SWCP: Que tipo de atividades fazem? A.P: Nós somos uma organização de costuming e performance de sabres de luz. 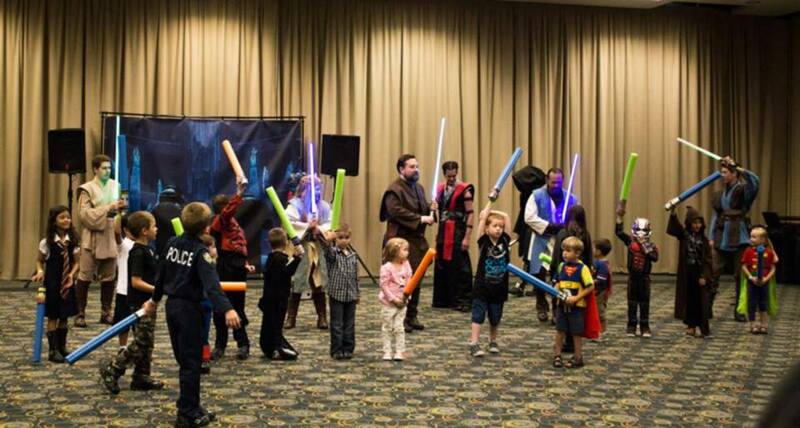 Atuamos em eventos comunitários e de caridade, convenções de cultura pop e bd e em eventos oficiais de Star Wars, tudo para angariar dinheiro para as várias instituições de caridade que apoiamos. SWCP: Cobram algum tipo de dividendos pelas vossas presenças em eventos em que são solicitados ou recebem donativos para fins de caridade? A.P: Não cobramos pelas nossas apresentações ou comparências. Em vez disso, nós encorajamos os organizadores dos eventos a fazerem doações para caridade. SWCP: Para os interessados em se juntarem ao vosso grupo,o que têm de fazer? SWCP: Dos eventos em que têm participado,há algum em especial que gostarias de destacar? A.P: Fizemos alguns eventos maravilhosos para a fundação Make-A-Wishe atuámos em hospitais infantis e na Ronald McDonald House. Esses são os eventos que têm mais significado para nós. 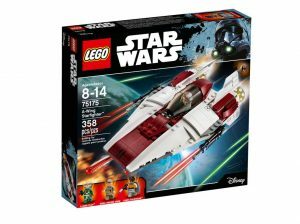 SWCP: Que mensagem queres enviar aos fãs de Star Wars em todo o mundo? 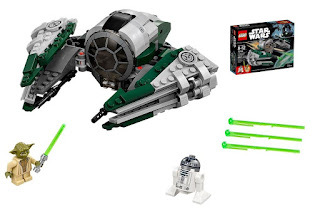 A.P: Star Wars une as pessoas. Vamos retribuir às comunidades e aos fãs e organizações que nos apoiam e partilhar o nosso amor por essa franquia fazendo a diferença na vida dos outros. The Saber Guild Council ( www.saberguildcouncil.com) is an international lightsaber performance and costuming organization. 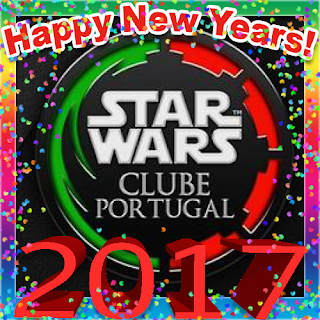 In this interview with the PR Director Saber Guild International, Adrienne Procaccini, we will know better the activities of this group. SWCP: - When and how did the idea to create the International Saber Guild Council? A.P: Sorry, I wasn't around when Saber Guild first formed. SWCP: What kind of activities your groups do? A.P: We are a lighsaber performance and costuming organization. We perform at community and charity events, comic and pop culture conventions, and official Star Wars events, all to raise money for the various charities we support. SWCP: Do you charge any kind of fee for your presence at events that are requested or received/raise donations to charity? A.P: We do not charge for performances or appearances. Instead, we encourage event organizers to make donations to charity. SWCP: For those who are interested to join your group,what they have to do? SWCP: Would you like to highlight any event that your group participated? A.P: We've done some wonderful events for Make-A-Wish and have performed at children's hospitals and the Ronald McDonald House. Those are the events that mean the most to us. 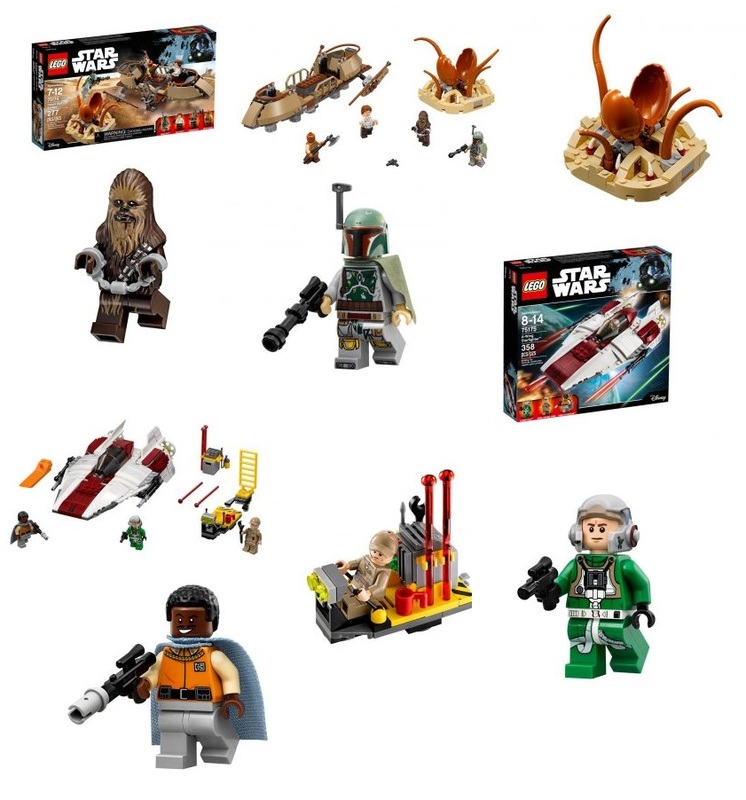 SWCP: What message would you like to send for Star Wars fans worldwide? 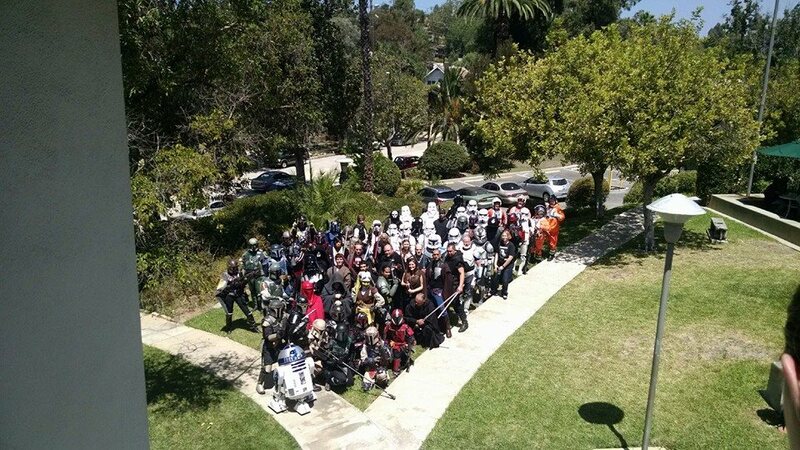 A.P: Star Wars brings people together. Let's give back to the communities and the fandom that supports us, share our love for the franchise and make a difference in others' lives.